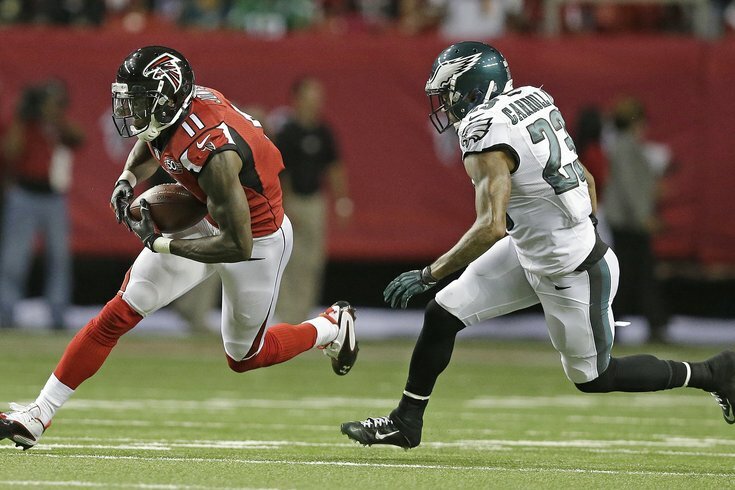 Julio Jones toasted the Eagles defense last season for 9 receptions, 141 yards, and 2 TDs. After a pair of road losses to divisional rivals, the Philadelphia Eagles stumble home to take on the Atlanta Falcons, who are an offensive powerhouse. The Falcons score a lot of points, and they give up a lot of points. Here are five matchups to watch. Breaking: Falcons wide receiver Julio Jones is really, really good. In 2015, Jones caught 136 passes for 1871 yards and 8 TDs. Through the first half of the season, Jones has 51 catches for 970 yards and 5 TDs. "All those big guys, even when they're covered, they're still open because their catching radius is so big, they're so strong, they’re so physical and they can jump," said Jim Schwartz. "I think that's what takes Julio to a level that's different than other NFL receivers. He can threaten deep down the field; he can catch the ball over the middle; he can take a short pass and he can run. He’s extremely strong and he's hard to knock off his routes. "I mean, Larry Fitzgerald has a lot of that. I think Julio Jones might even be more explosive and more dynamic than Larry Fitzgerald, who is a Hall of Fame receiver. "[Jones is] not super tall; it’s not like he's 6'6" or 6'8", but he's tall enough and his arms are long. I think probably the No. 1 thing is his physical strength and his ability to make catches in traffic, make contested catches and get open versus press coverage. Those are all things we're going to have to take into consideration." It feel like the Eagles get a new great receiver to defend each week. Julio might be the best of the bunch. In Week 1 against the Falcons a season ago, Cox was a menace. The stat sheet showed that Cox had two tackles and one sack, which doesn't look particularly impressive, but he made a number of huge plays that went for naught. In the second quarter, Cox had a sack fumble that the Eagles recovered, but the Falcons retained possession because of an Eagles penalty in the defensive secondary. Cox also put a hit on Matt Ryan later in the game that should have led to a Malcolm Jenkins interception, but was dropped. In that game, Cox was working against LG Andy Levitre and LT Jake Matthews. This time around, Cox will most often be lined up opposite Chris Chester, who will turn 34 in January and is the weak link along the Falcons' offensive line. The Falcons undoubtedly remember that Cox nearly wrecked the game last season, so expect them to give Chester plenty of help. "When you're a dynamic pass-rusher in the NFL, when you can make an impact, offensive line coaches are going to start their game plan with No. 91," said Schwartz. "Offensive coordinators are going to do it." Still, it's not like the Falcons can double him all day. On occasions where Cox finds himself lined up one-on-one vs. Chester, he's going to have to earn his $100 million contract and make some plays. "The Falcons are playing well, offensively, because they're not a one-trick pony," explained Schwartz. "You talk about Matt Ryan, we talk about Julio Jones, but they run the ball very well. Their stats aren't great running the ball, but they're significant. They’ve got a running back that can break anywhere. It's not just Julio Jones. You guys have to check the stats, but I think they've won three games this year that Julio Jones really didn't have a big impact on. [In those wins] his numbers weren't great, but they were still able to win the game. I think that's a sign of a good offense. Whether one guy isn't having a good day, or defenses scheme to take him out, they still had enough to go to." Coleman in particular has been a big-play guy as a receiver out of the backfield. On the season, Coleman is averaging a ridiculous 17.4 yards per catch, and has seven catches of 20+ yards, which ties him for the league lead among NFL running backs. Update: Tevin Coleman is OUT vs. the Eagles this Sunday. Vic Beasley mostly lines up at LDE, which means that he'll be opposite RT Halapoulivaati Vaitai all afternoon. On the season, Beasley has 7.5 sacks and three forced fumbles. The Eagles have been forced to give Vaitai extra help all season long regardless of the opponent, and that'll be no different this week against a very talented defensive end. To some degree, it might not be a stretch to suggest that the Falcons' best pass rush rusher might even be wasted because the Eagles give so much help to that side of the line as it is. Four of the five interceptions Carson Wentz has thrown this season have come in the first quarter of games. On the season, he has thrown one TD pass and four picks in the first quarter, and eight TD passes vs. one pick the rest of the way. Against the Vikings, Wentz threw two bad picks early on, but the defense was able to bail him out. Against the Giants, again, Wentz threw two bad picks and the Giants took a commanding 14-0 lead. While I don't think the solution is to neuter Wentz early in games, perhaps it might be wise to call a few plays early on that have a high chance of completion, just to get him on track.